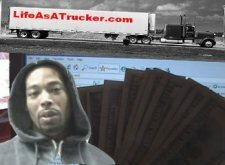 First question that many have is, "How much money do truckers make?" It's a simple question with a complex answer. I could tell you that in 2018 average truckers will make about $50,000 but there are many variables that will determine a trucker's salary. New drivers can make $25,000 - $45,000. There aren't many jobs that you can get into with so little training and no experience that will pay as much as a professional truck driver. Pay for a new truck driver naturally is at the bottom of the pay scale. This is much lower than what most people expect when they are considering becoming a truck driver. A new company driver in 2018 will make anywhere from $25,000 to $45,000 as a big truck driver. That makes the average newbie making about $35,000 per year. A driver with two years driving experience can expect to make between $50,000 and $75,000. (and possibly more) Why such a spread you might ask? See the bullet points at the top. An Owner Operator average earnings can range anywhere from $35,000 to $75,000 net after taxes. Doing the average lease program while still paying for the truck. Owner operators who are not in a mega carrier lease program getting cents per mile and but instead are getting percentage of the load, can easily clear $75,000 and earn more than $100,000 per year. Movers, heavy haulers, Oilfield drivers can make as much as quarter of a million dollars before taxes which is well over $100,000 per year take home with a proper records and good accountant. But there is a lot you need to know about becoming an owner operator. Bottom line, it is a business.